Image courtesy of Lakewood Brewing Co. (click to enlarge). 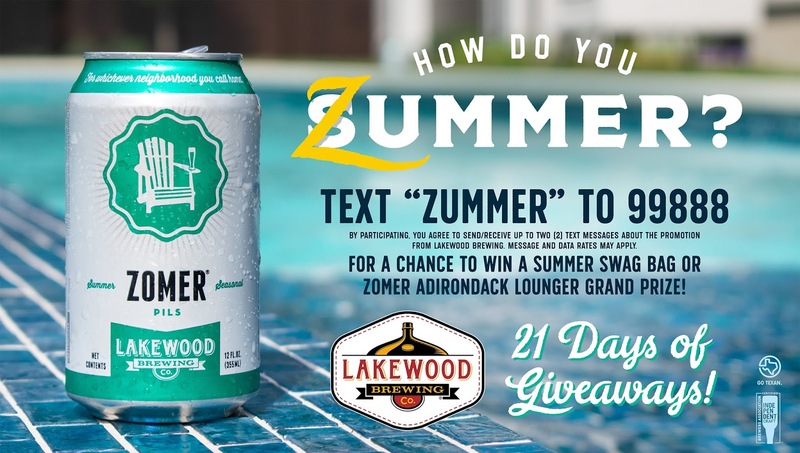 Hot on the heels of the annual release of its summer seasonal, Zomer Pils, Lakewood Brewing Co. of Garland is launching a new text-to-win "How I Zummer" program for fans of the beer and brewery. From May 21-June 11, Zomer (Flemish for summer) lovers that text "Zummer" to 99888 will be entered to win special prizes. A total of 21 daily winners will receive a Lakewood Brewing summer swag bag including a beach towel, koozie, sunglasses, lip balm & stickers. 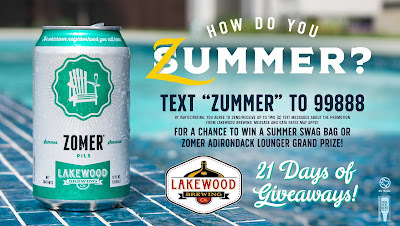 Plus, 10 grand prize winners will win a custom Adirondack Lounge Chair, perfect for relaxing poolside with a cold Zomer Pils. Brewed with Belgian pilsner malt and dry-hopped with a combination of Lemondrop and noble hop varieties, Zomer Pils is described as a light, crisp, and refreshing beer, with a slight, citrus peel zing. Look for Zomer Pils on tap and in six-packs of 12-ounce cans.